Okay, it's been a while I've had this issue, so I guess I should ask: I can't seem to be able to include an image in my signature; when I do it under "Edit Signature", it returns a message stating it can't determine the size of the image. I can, however, include it as a thumbnail though. Anyone know why this is? I fiddled around with some settings and removed the height restrctions. Let me know if you have any more issues. Hey, it works now. Thanks a bunch! My Dango go bye bye? I'm not sure, but I'll look into it. Are there any special issues - is it only in certain forums and not others or possibly posts I've moved or swapped threads on? The site will be undergoing a wee bit of a rehaul the weekend of the 15th (crap... next weekend!) and some parts (like the forum) may be temporarily unavailable. Just a heads up! 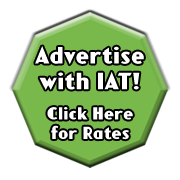 Do I see a redesigned IAT logo on the forums? Oh, I know, let's start a rumor that a site wide redesign is on the way.